I had a moment, last year, while working on Swords, where I found myself compelled to hack D&D. It was like I was exorcising a demon. With both Sw/oM and the hack, I was striking at the very roots of my gaming in an attempt to capture the essence of what lured me into this hobby. And what I was finding was two completely different games. Swords answered all the promises in one way; and something in that Basic-Expert-Companion set combo felt like the other way to answer them. ACKS looks like it’s hitting right on that second way. I’m excited about that. I think that one of these different games empowers GMs, and the other empowers players. As a GM I don’t feel compelled to work out economies in a rigorous way. I want to be able to make stuff up like “gold pieces are huge things that weigh 1/10th of a pound because the gods designed them for their own hands” and “coins are inherently Lawful because of this divine origin, and because they symbolize the sun” and “dragons hoard gold because, as Chaotic creatures, they seek to weaken civilized economies by depriving them of their life-blood.” I just want to throw these ideas out there half-baked; I don’t feel like I need rules for how a dragon in the region would cause a depression, because if it seems to make sense that this would happen I’ll just use my narrative authority to make it so. This is the style of play that “why let us do any more of your imagining for you” systems like OD&D facilitate for GMs, and modern indie improv and shared narrative authority games like Swords without Master facilitate for all players. But when they sit down to scratch their itch to “play D&D” with whatever system best acts as a backscratcher for them at the moment, I think most players neither have nor want the kind of narrative authority that would let them say “My robot cleric attracts more followers because it’s sitting on a giant pile of gold that demonstrates how well it has pleased the Lawful deities.” Even though that totally follows from the premises, I can see why as a player I’d want rules to show how I could make that follower-attracting goal happen in incremental steps, and guarantee that I can make it so without the GM taking the improv in some other direction. The great promise of old-school sandbox games is that your character’s goals and beliefs can organically become part of the game by just taking concrete actions in the world that will make them manifest. Yes, there is a strong belief in rules-lightness in the OSR. And yes, as a GM it no longer appeals to me to calculate the construction costs of every castle I plop down on the landscape. But I think there is a real utility for players in having detailed rules for building their own castles, running their own thieves’ guild, and every other kind of concrete, large-scale way they might act on their beliefs and pursue their goals. For GMs, I think the virtue in having a ruleset like Adventurer Conqueror King that thoroughly encodes those detailed economic rules is that when you randomly generate a band of knights, the size of the castle it is implied they come from makes sense given the size of the domain it supports and all that other world-building stuff I want baked in rather than having to pay attention to myself. This kind of “making sense” is important because it enables appropriate player action. The party won’t be frustrated that they can never afford an army big enough to reduce to rubble these castles that pop up as a result of dice-based-improv, because the tables that generate the castles follow the same internal consistency as the rules the players use to build them. they lead in lots of different directions and leave open what the game is about in a way that combat, which is where most detailed rules development tends to happen, does not. 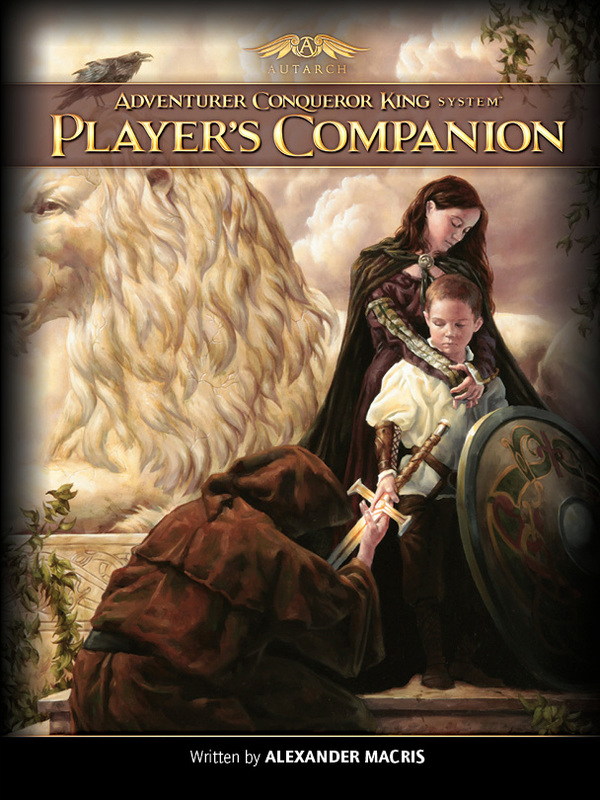 Players who really want to build strongholds may feel gypped if they don’t get to use those rules, but I think that providing lots of rules for combat produces a much stronger feeling that a session without using crunchy fighting rules is a waste of time, and tends to disempower players who want to make non-combat characters. Over at The Delver’s Dungeon, there’s an interesting thread about whether you can have a frightening dungeon crawl. I’m of the opinion that while it’s very difficult to scare players who don’t want to be scared, it’s very easy to scare players who do want to be scared, as they’ll do all the heavy lifting for you. It’s a matter of personal investment; the more immersed a player is in the game, the more likely it is that they’ll react emotionally to what’s going on—whether or not you intend for that to happen! 1) Threat: If the players actually value their characters’ lives and put themselves in their characters’ shoes, then they’ll be at least a bit scared of anything that they recognize as a serious threat to the PCs. Note that this is a matter of perception rather than fact! In my game, the players often charge into fights with powerful opponents without too much worry, but they’re chary of ghouls because several encounters with ghouls have resulted in near-TPKs. 2) Mystery: Sometimes unknown danger is more threatening than the known, because it could be anything. 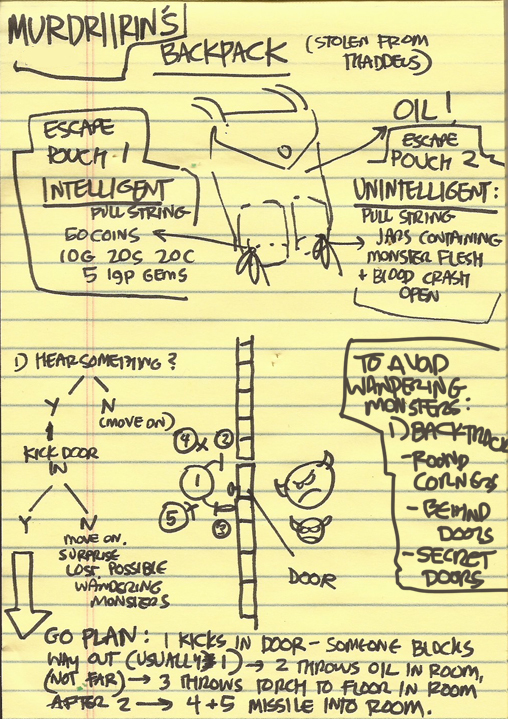 For at least a dozen sessions, the thing in my dungeon that most unnerved my players wasn’t a monster, but a stairway. It was an enormous thing that wound deep into the earth, its lights growing dimmer as they went down until it disappeared into darkness. They didn’t know how far down it went or what lived at its base. This allowed them to invent their own fears. As a player, what have you found scary in a D&D session? As a DM, what have you done to scare your players during play?